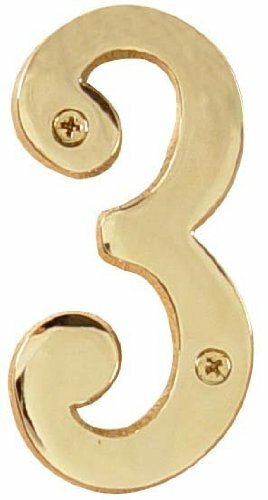 6" Height Solid Brass Address Number Three from the Door Accessories CollectionFor a quality, beautiful look, Emtek s Door Accessories cannot be beat. Like all Emtek products, the craftsmanship and materials that go into their household hardware is top quality. Emtek s brass hardware coordinates perfectly with other household hardware finishes. Features:Solid BrassHeight: 6"Width: 2-3/4"Projection: 3/16"Matching screws includedEmtek is dedicated to bringing interesting, well made hardware back into American homes. Emtek s mission is to satisfy the higher expectations of today s homeowners with regard to door locks. They strive to provide a broad and interesting range of products that consumers can use as elements of decor, and not just as a way to latch a door.